Happy Monday my friends. Today's outfit is from my latest Stitch Fix shipment, and I couldn't have asked for a more perfect fall look. How gorgeous is this burgundy sweater? Not only is the color beautiful for this time of year, but I'm loving the fit, and how the side slits gives it a tunic-like feel. I paired it with these Liverpool jean leggings, and finished my look with a plaid infinity scarf, both of which were also in my latest Stitch Fix shipment. These jeans happen to be one of the most comfortable pairs that I have ever worn. Now, the last thing I need is a new pair of jeans, so I sent them back, however, I'm thinking that I should of kept them, and will probably ask for them in my next fix. Not only are they a high rise, but they have an elastic waistband making them beyond comfortable and easy to move around in. Plus, I'm loving the $78 price tag, because they look like a designer pair of denim. To be completely honest with you, I didn't keep any of these items. Trust me, if I had the budget I would have kept all five (seriously love my stylist), but I had to narrow it down to one item this shipment since I have been non-stop shopping this past month. I ended up keeping a button back sweater with leather elbow patches (pictured below) which I'll be sharing on the blog soon. You can also see my Stitch Fix unboxing, and all five items on my Snapchat (Rach480) and Insta Stories today. 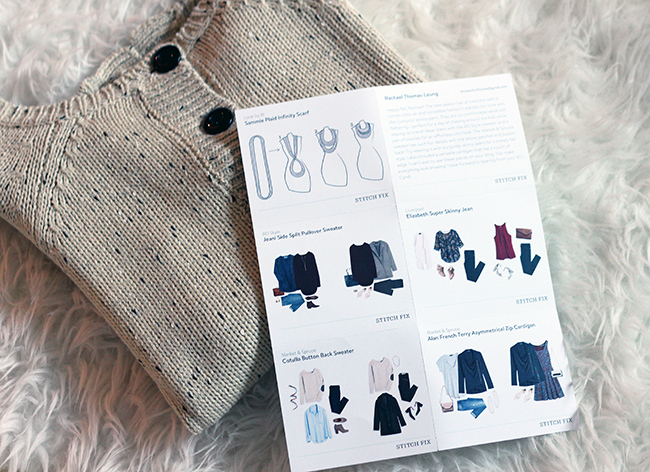 With the holidays approaching, it's time to start thinking about your holiday shopping and a Stitch Fix Gift Card would make a perfect gift! In addition to clothing, you are giving the gift of a personal stylist, and convenience to your loved ones. And ladies, don't forget about those handsome fellas in your life, because Stitch Fix now available for men! You can view my past two Stitch Fix reviews here and here, and read my tips for always getting that perfect fix here. The color is gorgeous. I will for sure check out style fix. you look stunning in burgundy! great fall style! That is a great sweater, and I love it with your scarf and boots. I always wonder how mnay items I would keep if I signed up for the service. Love the color of your top, and I need those boots! Great boots! I am so in love with peeptoes! I even want to wear them with socks! Loooove that cool sweater, lady- it looks awesome on you! I just did a Stitch Fix review myself and sent everything back, even though I felt it was a decent Fix. I love your sweater and jeggings. Love the uniqueness of the button back sweater. I really like the idea of Stitch Fix, but I love shopping so much myself that I can't fathom paying someone to do it for me! But I didn't know they had gift cards and that is a good idea for Xmas! The color of your sweater is just gorgeous! Great look! I love your stitch fix posts! You get such great items! Your sweater color and button detail is adorbs! That sweater is gorgeous! I absolutely adore those fab booties! Love the color of your sweater and those booties are so fab!! You come up with the BEST outfits - I absolutely adore this look!!! They sent you the best stuff in this shipment this time. The sweater and scarf are meant to be together and I just love the open-toe booties. Congrats on your beautiful niece Lillian by the way?! You ALWAYS end up with the greatest Stitch Fix pieces!